Jonah Rogel Benjamin (Jha) and Christian Albert Silva (Chano) met in 2010. Back then, Jha was still a 4th year college student at the Centro Escolar University (CEU) in Manila. Jha’s classmate had a boyfriend who was friends with Chano. That classmate and her boyfriend decided to introduce them to each other, since they were both single at that time. Jha and Chano planned to meet up. However, this meeting was postponed three times. Then, one day, Chano just texted Jha. It was the beginning of it. The two exchanged text messages for two to three weeks until they finally decided to meet up in person. Their first meeting took place at McDonald’s near East Avenue Medical Center in Quezon City on June 15, 2010. It wasn’t love at first time but for some reason, the two decided to become a couple on the same day. Up until now, Jha and Chano still could not believe that such an impulsive decision led to something great. Sure, it was a bit crazy but it was definitely one of the best decisions they have ever made in their lives, especially it didn’t take that long for them to realize that they were meant to be. “Knowing that the person is the right one [for you] is something felt by the heart without specific reason. Destiny will always find its way to make you feel that the person standing in front of you is the one,” Jha said when asked how she realized Chano was his Mr. Right. It was, perhaps, the reason why she introduced him to her family immediately. She asked blessing from immediate and extended family members, including the ones who were abroad. It was new to her, since she didn’t do the same thing for any of her past relationships. Chano proposed to her on their 4th anniversary in Coron, Palawan. They were doing some island hopping that day. When they were in the middle of the sea, on the way to Cayangan Lake, Chano suddenly went in front of the boat and got his camera stand bag. At first, Jha thought that the was just going to take some photos. She didn’t even bother even as he started talking. She could not understand what he was saying in the first place. And she never thought he was already about to propose. “Mahal, pakasalan mo na ako,” Chano told her out of the blue then laughed. She could not believe it. In fact, she thought he was just joking until he pulled out the ring from the bag. She finally made sense of what was happening and believed that it was for real. She said yes, of course. The next thing they knew, they were already busy making plans for the wedding. Jha was a hands-on bride. She chose her wedding suppliers by herself, thinking it would be great if she would be able to talk to each of them personally. It was, according to her, the best way to find out if a certain wedding supplier was the right one. Jha also spent lots of time surfing the Internet, attending bridal fairs, reading blogs, and watching SDEs to get as many wedding ideas as possible. These materials served as her guide as she chose wedding suppliers and came up with ideas. To make sure she would be able to focus on the preparations, Jha resigned from her job four months before the big day and went back to the Philippines. That way, she was also able to add some personal touches on her wedding needs. His husband was highly involved with all the preparations, too. Since he was already working as an architect, he was the one who took care of the invitation design and layout. He kept it plain and simple; not too many embellishments and accents to keep it minimal yet very elegant. He also approved designs, layouts, and formats of other wedding needs. The couple was also lucking for having a very helpful wedding checklist, something their caterer/stylist gave them. It was where they placed their ideas and sample photos, allowing them to express themselves freely and visualize that they wanted to see on their wedding day. The checklist also had forms, which they filled out. Then, to their surprise, they figured out that they were already conceptualizing that way. Making major decisions for the wedding was both fun and tough. Originally, Jha and Chano wanted a black-themed wedding. But then, they realized that elders might not like it. They respected them a lot, so they gave up on the idea and just picked a color that was close to it but lighter. 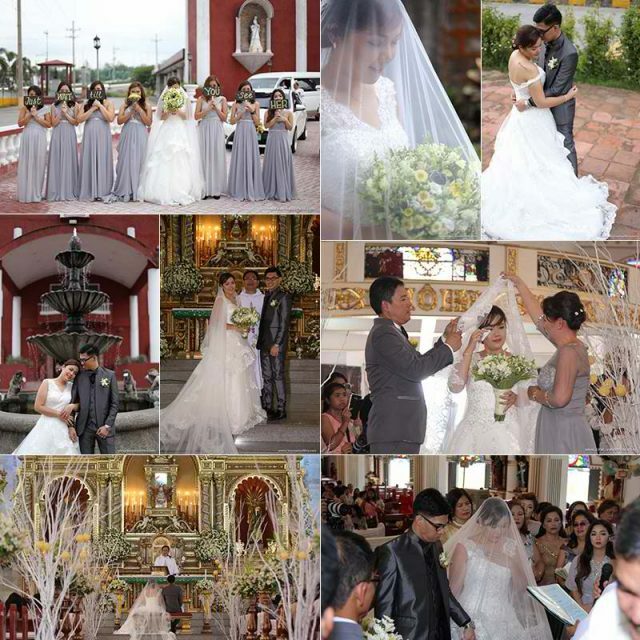 In the end, they decided to have a classic vintage and travel-themed wedding with gray motif and yellow accents. The bride and the groom’s unfamiliarity with some traditions also made the process of selecting godfathers and godmothers a bit challenging. At first, they just selected 10 godfathers and paired them with their choice of godmothers. However, they were told by Chano’s sister that it should not be done that way. Instead, their married godfathers should be paired with their own wives, in the same way as their godmothers should be paired with their husbands. Following this advice, they ended up having 20 pairs of grandparents. Another challenge they faced was the cancellation of their entourage’s transport service three days before the wedding. It was promised to them by a relative. Although aware that it was already sold to another person, Jha and Chano thought that it would not be released to its new owner until after the wedding. However, there were changes with the deal and it suddenly had to be turned over before the big day. The couple felt devastated upon learning about this. They were also worried, since they could no longer afford hiring another service for the entourage. Good thing, Jha’s parents came to the rescue. They told her not to stress herself out because of it. Then, they shouldered the rental fee of two vehicles—one mini coaster for female entourage members and a Grandia for the guys. Jha and Chano got married on May 28, 2016 at Sto. Nino De Cebu Paris Church. The reception was held at Tagaytay Haven Events Place. Osio’s Catering helped Jha and Chano a lot to have a successful wedding. This wedding supplier has just expanded its line of services recently, so they were able to provide other services for the couple as well. In short, Osio’s Catering served as their caterer, stylist and coordinator. It was through this team’s amazing performance that Jha and Chano had a hassle-free wedding day. Everything was good, from coordination to the food served during the banquet. The styling at the church was impressive and guests were all well-guided. Jha and Chano could feel the entire team’s love and passion for what they were doing. They also showed genuine concern toward the couple, as if they were real family members. They wanted the best for Jha and Chano, not because they were paying clients but also because the couple deserved them. These people assured the couple that everything was taken care of and that the wedding would be wonderful. And yes, they didn’t disappoint. Even Jha and Chano’s guests loved what they came up with. 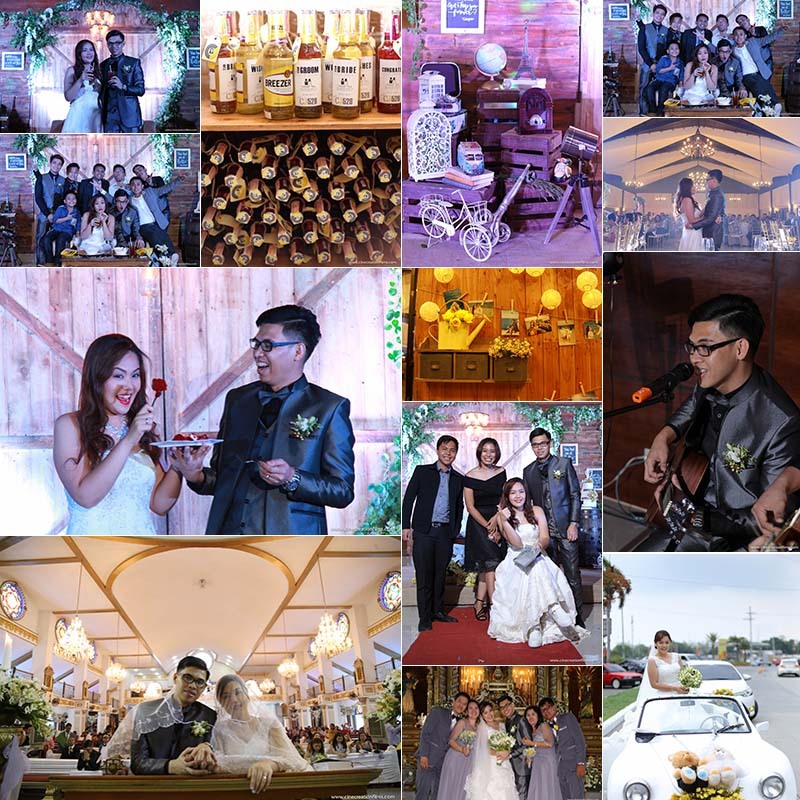 Apart from rendering excellent services, Osio’s Catering also introduced the couple to their partner suppliers, including RDS Lights & Sounds, Hearts & Bells, and Talia Reyes Acoustic Band. All of them also did a very great job ensuring that the wedding would be fun and memorable. Of course, Jha and Chano were also grateful for the help of the other wedding suppliers, including Cinecreationfilms, Blackout Mobile Bar, Laguna Love Dub Bridal Car, D & C Bridal Boutique, Elegance Bridal Boutique, Charles & Keith, Summit Signature Shoes, Arobi Wines & Souvenirs, and Tagaytay Haven Events Place. What made this wedding unique was Chano’s special performance, which was a mashup of “Kahit Kailan” and “Tatlong Bibe”. It might seem too odd but yes, he was able to pull it off. Jha also stood out with her nine-meter crystal-beaded wedding veil. It looked so good on her as she walked down the aisle. This moment was made even more dramatic with her high school friend Jules Modesto’s rendition of John Legend’s “You and I”. In fact, she felt goosebumps. She was so emotional and she could not forget about the experience. She also appreciated her friend’s song, which was his wedding gift to her. As mentioned earlier, the guests loved everything about their wedding. They loved how solemn and heartwarming the ceremony was, thinking that the couple must have been blessed and embraced by God. They also loved the reception. Tagaytay Haven Events Place was classic and cozy. The venue also complemented the elegant styling done by Osio’s Catering. Of course, everyone also loved the food. They were also satisfied with the quality service provided during the banquet. The wedding souvenir was also praised by the guests. It was a bottle of Bacardi Freezer, lovely labeled by the bride herself. Guests had fun watching the videos presented at the reception, too. Jha advises brides-to-be to avoid experimenting a lot, especially when it comes to skin care. In her case, she had facial cleansing less than two days before the wedding. It was a huge mistake, she realized later on. Imagine, some parts of her face and nose were still swollen on her big day. She also gives an important tip on selecting wedding suppliers. “Fellow brides-to-be, ‘wag masyadong ngarag sa pag-prepare. Select suppliers that are really trustworthy,” she said. Anyway, according to her, it would just be easy to tell whether a supplier is really concerned about the couple and the wedding or it is just after the money. She also believes that brides should also stop overthinking the day before the wedding, so they wouldn’t be haggard on the much awaited day. “All the perfect and imperfect things that will happen on your big day are really intended to be part of it. After ng kasal niyo, matatawa na lang kayo. For us, it was all worth it, despite some little flaws that happened,” she ended.